With three books out in the Adam Fletcher Adventure Series, I thought it would be a good idea to write a post about the place names used in the novels — especially since I don’t always stick with the exact historical place names that were in use in the timeframe the books take place. While this might seem heretical for historical fiction, I thought long and hard about this before deciding to use (for the most part) contemporary spellings of places like New Bern and Charleston. At the same time, I do alternate between the use of Port Beaufort and Beaufort. There were many reasons why I chose to do this, but primarily, it’s to stick with a consistent spelling and not confuse readers. I chose to use the spelling New Bern for the first book of the Adam Fletcher series. My family has been from Craven County for centuries so I have a great attachment to that place. The town was settled by Baron Christoph von Graffenried in 1710 as New Bern, named for the city of Berne, Switzerland. In the following decades, the town’s name was written as Newbern. For a time during the mid-to-late-1800s, it was written about in newspapers as New Berne. Then, in the 20th century, we see the original spelling, New Bern, become the norm again. I decided to use the town name’s original spelling both because it is the original spelling of New Bern, and because the colonial capital is a popular tourist destination today. I want folks who’ve been to New Bern, or are planning to visit, to realize that the town in this book is the same place as the beautiful historic town in Craven County, North Carolina. In the novels, you’ll find both names in use for Adam Fletcher’s home town. 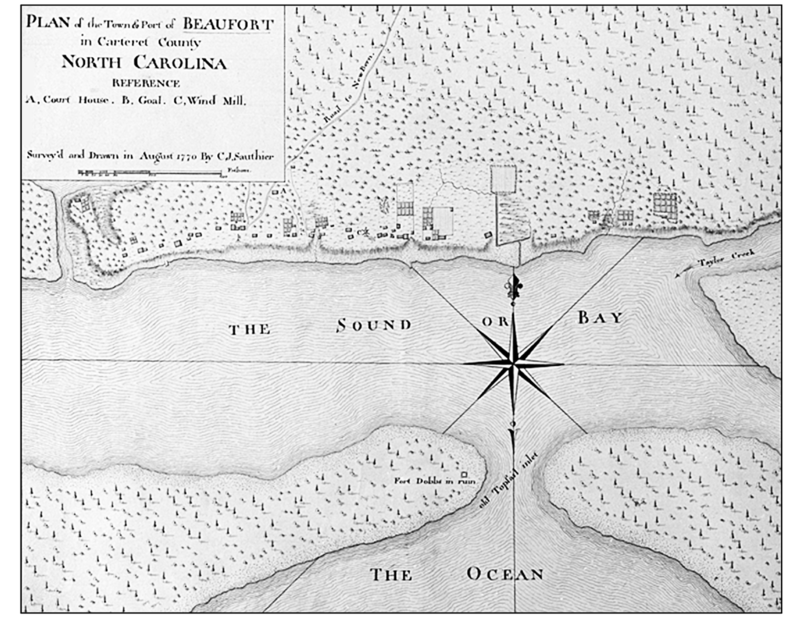 Historically speaking, you’d often see Port Beaufort or Port of Beaufort on maps or in official writings about the town (such as in the Colonial Records), but in conversation, people would have most likely just said “Beaufort” unless they were specifically referring to the shipping business. Any look at old colonial-era maps will yield a variety of spellings of place names. Newspapers at the time also used various spellings of some places. In fact, I have seen maps and newspapers from the same period of history that use Charles Town and Charles-Town as the spelling of what we know today as Charleston. We can assume the pronunciation “Charleston” was likely in use in speech before 1783, but it’s anybody’s guess how long it may have been said like that. Since I’m unsure yet of just how far into the Revolutionary era Adam Fletcher’s adventures will go, I chose to use the 1783 spelling of the name of the famous South Carolina port city. Regardless of how the names of these old towns are spelled, they are all wonderful places to visit. They are rich with history, timeless architecture, and beautiful waterfronts. Also, be sure and read all of the Adam Fletcher series. I include all kinds of little known facts and real history in every novel — the kinds of things you won’t often hear about from a tour guide.